Evaluation and Experiment: Some Critical Issues in Assessing Social Programs is a collection of papers presented at the 1973 symposium held at The Battelle Seattle Research Center. This book contains eight chapters that consider some selected aspects of the problems in evaluating the outcomes of socially important programs, such as those dealing with education, health, and economic policy. The first chapter provides an overview of the issues around the Social Program Evaluation. The next chapters deal with the successes and failures brought by social innovations; the quasi-experimental evaluation in compensatory education to estimate the true effects of such education programs; and the usefulness and validity of econometric and related nonexperimental approaches for assessing the effects of social programs. These topics are followed by surveys of a number of additional program-evaluation studies, particularly in the field of family planning or fertility control, mostly carried out as experiments or quasi-experiments in Asian and Latin American countries. Other chapters describe the decision processes that involve explicit assessment of the worth or merit of outcomes and employ multivalued utility analysis and outline the ways in which evaluative data are useful in providing feedback to program or institutional operations and decisions. 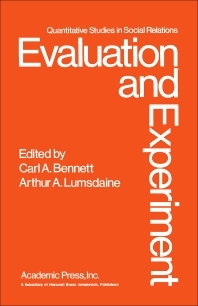 The final chapter discusses resolutions for some of the disagreements expressed by others concerning the role of field experiments, constraints in their utilization, and other factors that enter into a comprehensive conception of program evaluation. F. Does Randomization Imply Coercion? C. The Question of "Gradualism"
C. Three Illustrative "True Experiments"
A. What Is a Variable in a Social Program? G. Who Decides What Will Be Studied?